The classic-style single room features a flat-screen TV with cable channels and a private bathroom with a hairdryer. 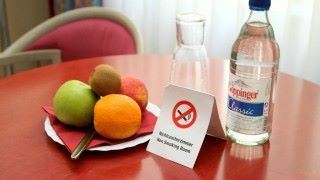 Almost all rooms in the LeoMar Flatrate Hotel Ulm are non-smoking rooms. Please feel free to ask us about a special room for smokers. Our single room Ulm is an ideal accommodation for those who value good quality service for little money. The spacious room features a large single bed, a flat-screen TV and a private bathroom with under-floor heating and a hairdryer. The classic-style room features a flat-screen TV with cable channels and a private bathroom with a hairdryer. Most rooms at LeoMar are non-smoking. Smoking rooms are available on request. This room features two separate beds, a flat-screen TV, desk and private bathroom with shower. Two separate beds, 90cm x 200cm each. The most rooms in the LeoMar Flatrate Hotel are non-smoking. Please feel free to ask us about a special room for smokers. The classic-style triple room features a double and a single bed, flat-screen TV and the en suite bathroom with a hairdryer. The classic-style triple room features bunk beds, dining area, refrigerator, flat-screen TV and the en suite bathroom with a hairdryer. Families are welcomed in our hotel in Ulm. We provide families the classic-style rooms featuring a double bed, a single as well as modern comfort and enough space for all family members. Our room rates depend on the room type, amenities and the season. Please check your current rate using our booking system. Just click on the button and you will know what your special rate is. For a pet a one-time fee of 10 EUR will be charged at the hotel. We guarantee the best service for the best rate! The offer is nowhere online bookable! Please feel free to contact us directly (via Email or telephone) in order to receive precise information on the room types, amenities and rates. We will be happy to give you a comprehensive consultation and to reserve a room for you. We are looking forward to welcome you in our hotel in Ulm!